Home \ Sean’s 7 Day Fitness Challenge is now Live! Take Sean’s 7 Day Fitness Challenge! 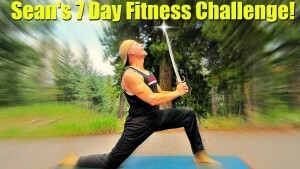 My friends, by popular demand I created this new 7 Day Fitness Challenge just for you! It features 7 days of complete workouts (Monday-Sunday) including weight training, power yoga, core blasting, flexibility training, cardio HIIT, pull ups, Pilates and more. Want more? Jump on my special 30 day program SVF 365! Enjoy and all I ask is that when you finish (or not) each workout you give a “Thumbs Up” and comment on the video then share this challenge w/ friends and family on your social media. Enjoying this challenge? You MUST also do my 7 Day Yoga Challenge and 7 Day Pilates Challenge! These are awesome workouts! I must admit it is quite hard (especially the first one, (planks aaaaah), but everything that is valuable is hard right? I love exercising with you! In a Q &A session you said not to work abs everyday but how can you not when doing full body weight, plank, yoga. ..exercises which all incorporate core. So not to do classic 5 pilates everyday I can understand, but please clarify 72 hour ab recovery in the midst of working out everyday.